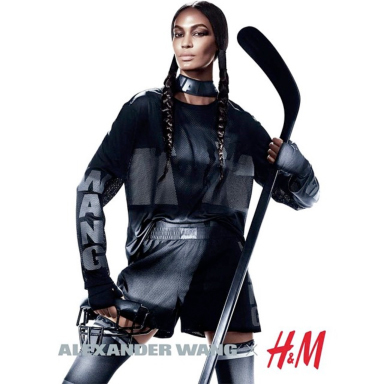 First Campaign Pictures of Alexander Wang X H&M Unveiled! After months of thrilling anticipation, the cat is finally out of the bag! Fashion enthusiasts from all over the world have been waiting eagerly to see some first pictures of Alexander Wang's collaboration with H&M. Over the past weeks, celebrities like Rihanna already sported some of Wang's creations for H&M and presented us with the first promising glimpses of the upcoming collection. But now the New York-based chief designer of Balenciaga unveiled the official advertising campaign for his collaboration with the Swedish retail company. The campaign was shot by famous fashion photographer Mikael Jansson and features both models and professional athletes, who pose in the designer's creations while wielding various sports equipment. Runway goddesses Joan Smalls, Raquel Zimmermann, Isabeli Fontana and Natasha Poly star in the campaign along with kickboxer Rivaldino dos Santos and English soccer player Andy Carroll, which perfectly underlines the designer's sportswear-influenced styles. "We wanted to take certain elements of each sport and portray the ultimate warrior. The girls had to feel big and heroic, and Mikael used sunlight glares to heighten that effect against a stark white backdrop," Wang revealed to WWD. A TV commercial and an online film will follow the print campaign on October 30. 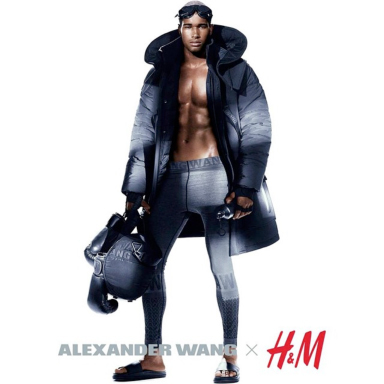 Wang's collection will hit the H&M stores on November 6.